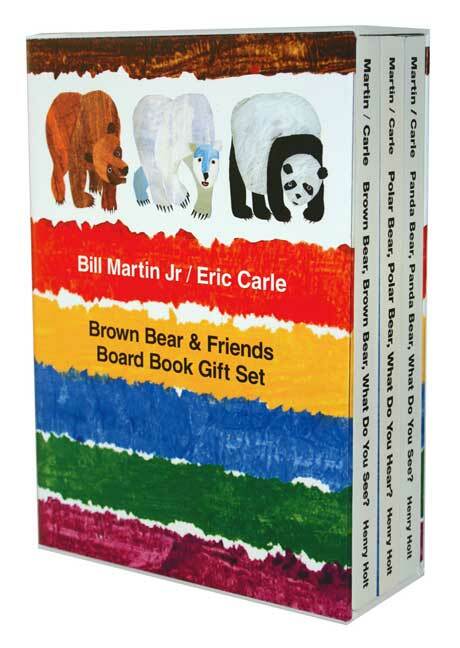 My four-month-old son received the Brown Bear & Friends Board Book Gift Set (Amazon affiliate link) for Christmas. It contains the three Eric Carle books — the classic Brown Bear, Brown Bear, What Do You See? — and two additional titles that I was not familiar with — Polar Bear, Polar Bear, What Do You Hear? and Panda Bear, Panda Bear, What Do You See? I love Eric Carle books for infants and toddlers, with their simple text and beautiful engaging pictures, so I was excited when I opened this gift. At four months, my son is just getting interested in reading books. Really, he is only interested in eating books right now, which is why this board book set is great – you can eat it while you read it. Since this my second child, I am more than aware of the classic Brown Bear, Brown Bear, What Do You See? In fact, as I was reading this one to my son, my four year old daughter was reciting it along with me. She has it memorized word-for-word. Polar Bear, Polar Bear, What Do You Hear? is one of my favorite kinds of children’s books. It’s all about animal noises – I hear a zebra braying, a boa constrictor hissing, an elephant trumpeting, a lion roaring. These kinds of books are a joy to read aloud – making animal sounds and giving your baby the giggles. When my daughter was a one-year-old, she loved any book with animal noises and before she knew the animals’ names, she could tell you what noise they made. Since I was really enjoying reading this book and making animal noises, I was disappointed when I got to the end. “Zookeeper, zookeeper, what do you hear?” It turns out that these animals can all hear each other making noise because they are all trapped in a zoo. This book is not as fun as I thought it was. Disappointed, I began reading the third book in the set — Panda Bear, Panda Bear, What Do You See? This book takes the idea of the original Brown Bear book to a new level. Instead of basic animals like a brown bear, you get specific animals like a macaroni penguin. And instead of the animal simply “looking at me”, the reader is introduced to a host of new action words such as a bald eagle soaring, water buffalo charging, spider monkey swinging. When combining the text with Eric Carle’s pictures, details of this book are quite beautiful. But what really makes this book special is how it ends. “Dreaming child, dreaming child what do you see? I see animals wild and free.” In direct contrast to the Panda Bear book, this book is a celebration of the beauty of animals living free in the wild. The Panda Bear book is now my favorite Eric Carle book and I plan to read it many, many times in the next few years to my infant son. I love Eric Carle books and would definitely recommend them to anyone with a baby, and they definitely make a great gift. But my suggestion is to skip the box set. Brown Bea is a classic, but if you are only going to buy one, jump to Panda Bear, Panda Bear, What Do You See?, which has beautiful imagery combined with an animal-friendly message.